The Original Working Manuscript of Alcoholics Anonymous Hardcover, cloth cover, 248 pp with dust jacket, 4-color interior. 11-1/4" wide x 13-1/2" tall, 5 lbs. An extraordinary reproduction of the original working manuscript of Alcoholics Anonymous, with essays and notes by a panel of celebrated AA historians. The Book That Started It All offers fresh insights into the history and foundation of the revolutionary Alcoholics Anonymous program. 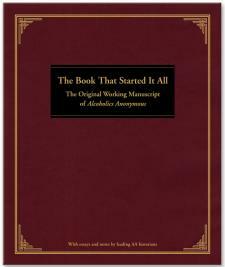 Reproduced in this elegant gift edition with essays and notes by a panel of celebrated AA historians, the original working manuscript is the missing link in our understanding of what transpired between AA founder Bill Wilson's first draft of Alcoholics Anonymous and the first published edition. In January 1939, Wilson and other AA founders distributed 400 copies of his typescript to everyone they could think of "who might be concerned with the problem of alcoholism," to test out the program. As the loan copies were returned, suggestions for revision were considered and written out in colored pencil on one master copy that was eventually submitted for publication. The many changes made in black, green, and red on page after page are shown here in their original form, revealing the opinions, debates, and discussions that went into making the Big Book.